Hooper pursues greatness like Javert pursues Valjean—does he get his man? Since its publication in 1862, Victor Hugo's Les Misérables has been adapted for radio, television, film, comic book and, of course, the stage. It has been romanticized, canonized, contemporized, monetized and even sequelized. To director Tom Hooper, these adaptations are the work of pikers. Thus, Hooper has charged himself with creating a film version of the stage musical so grand and definitive that all other iterations of the material can only withdraw into the shadows from embarrassment. In his follow-up to Best Picture Oscar winner The King's Speech, a reverent Hooper plays everything to the rafters, a strategy that admittedly yields great rewards. Claude-Michel Schönberg's soaring music has never sounded livelier, the production is rigorously detailed and the performers leave no lip unquivering and no tear duct untapped. For fans, this is exactly how the story of Jean Valjean's transformation from thief to saint should be delivered: smothered in bombast. But when Hooper carts out the shaky-cam, wide-angle lenses and vertiginous crane shots, he risks making this state-of-the-art Les Misérables a triumph of construction over character. Hooper's pursuit of crowd-pleasing scale occasionally leads him to overplay his hand, but all is forgiven by the next musical distraction. It's all visual excess tampered by his reluctance to dig too deeply into the musical's politics and religion—which for a worldwide audience is exactly what they want. The long-running musical (first performed in Paris in 1980) from which this film is based is a sung-through production containing almost no spoken dialogue. Hooper, knowing where his baguette is buttered, honors this. The challenge is that with the story and lyrics unchangeable, his decisions on tone and scale are crucial in making us care about the characters, especially since this material easily slips into grandiloquence. Does Hooper want the visuals to serve the characters, or do the characters just get us from one epic, Oscar-baiting set piece to the next? The answer is both. His big idea is the minutes-long, uninterrupted take, shot in close-up. He tries this early-on for "What Have I Done? ", where a humbled Valjean (Hugh Jackman), given mercy by the kindly Bishop Myriel (Colm Wilkinson), decides to turn his life around. The director returns to the motif when fired factory worker and shamed single mother Fantine (Anne Hathaway) laments her hopeless future in the musical's signature song, "I Dreamed a Dream." Some may argue that Hooper's reliance on close-ups betrays his roots in British TV, but really it provides the audience with an intimate view of the characters they cannot get when experiencing the work by novel or musical, its two most popular forms to date. No matter how he shoots the songs—the best numbers are the rousing "At the End of the Day," the mischievous "Master of the House" and the thrilling "One Day More"—they're so magnificent that your spirits will be inflamed, or at least sparked. Among this extremely well-chosen cast, Jackman, a Tony Award winner for the musical, The Boy from Oz, is astonishing as Valjean, a parole-jumper hiding out with the priests and peasants of 19th century France. 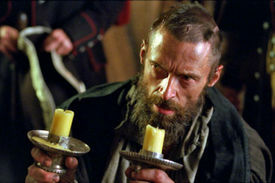 Jackman works both sides of Valjean's physical and spiritual transformation: at the outset, upon release from the prison where's he spent almost 20 years for stealing bread, his eyes are hollow and his visage long and low. By the end, he is fuller, greyer, distinguished and tired, having kept his promises while being stalked by the very Catholic themes of sacrifice and salvation. As Fantine, Hathaway is breathtakingly raw, almost to the point of being too theatrical. Still, her supernatural ability to project focus and passion convinces us that Valjean would dedicate his life to caring for Fantine's daughter, Cossette (Amanda Seyfried, singing in a thin, birdlike vibrato), the key act of charity that sends him towards spiritual redemption. Hooper cleverly required the actors to perform their songs live on-set and the finished film contains no lip synching or post-production vocal enhancements. This significant choice pays off almost subconsciously. For Russell Crowe, who plays Valjean's relentless pursuer Inspector Javert, singing live is nothing new. He has fronted numerous rock bands, although that's a long way from the more formal, demanding style required of him here. Within this new context, Crowe's huskier voice is a completely workable counterpoint to the angelic falsettos and unabashed emotionality of the other characters and, thank goodness, he can firmly hold a note. What works less is Crowe's rather one-note reading of the character. In Crowe's Javert is simply a Terminator bent on capturing Valjean, and by the time his fealty to the law gives way to the fatal realization that he's been shown mercy he could never return, it's too tight a turn for the character. What's often lost when concentrating on the more mainstream (read: romantic) aspects of the story is that Les Misérables is a political work about justice, morally, legally and financially. Hooper's desire to create a timeless film requires he takes the story's progressive politics at face value—he doesn't dare suggest the June Rebellion of 1832 that occupies the last third of the movie has any relevance to the socio-economic struggles of today. The critical player here is Marius (played by Eddie Redmayne in an absolutely revelatory performance), who straddles the two primary storylines that comprise the movie's homestretch: the Rebellion and the fate of Fantine's daughter Cosette. In 2011, the London-born actor raised some eyebrows playing opposite Michelle Williams in My Week with Marilyn. Seeing him here, with his boyish, freckled, imperfect face, delivering "Empty Chairs at Empty Tables" is to see an actor fully arrive from relatively nowhere—it's thrilling. Also notable is Samantha Barks as Éponine, an unknown who holds her own against a high-powered cast that includes Sacha Baron Cohen and Helena Bonham Carter, who gift the film some much-needed jokes in their roles as dastardly inn-keepers. This worshipful, inspiring, and occasionally tiresome Tom Hooper edition of Les Misérables is built to please. It's built to reignite the coals of the devout and steamroll the uninitiated. But this is not a textured work—it's the result of a director feeling the pressure to deliver. Hooper pursues greatness like Javert pursues Valjean. In the end, only one of them, if barely, gets his man.